Forrester Research, Inc. has positioned Microsoft as a Leader in The Forrester Wave™: Enterprise Cloud Databases, Q4 2012. Microsoft received the highest scores of any vendor in Current Offering and Market Presence. Forrester describes its rigorous and lengthy Wave process: “To evaluate the vendors and their products against our set of criteria, we gather details of product qualifications through a combination of lab evaluations, questionnaires, demos, and/or discussions with client references.” You can read the full report for free here: http://www.forrester.com/pimages/rws/reprints/document/70541/oid/1-LLP641. Meet Tech·Ed Middle East’s Top Voted Speaker at the Business Intelligence Roadshow. Rafal Lukawiecki, International Business Intelligence speaker, will be telling you all about simplifying performance management and business intelligence. Join us at this exclusive event as he demonstrates to you how these solutions can easily be used in your day-to-day business scenarios. With a special focus on Microsoft® SQL Server 2008 R2 and Microsoft® Office System 2010, this will be a full day seminar with exciting presentations and live videos from the business intelligence performance management expert. Results have just been announced from an IDC study on “Mission Critical Applications”. The survey gathered information from over 900 enterprise customers located across the United States, the United Kingdom, France and Germany. I found the results very interesting, and they provide strong evidence to support the leadership of Microsoft’s platform. For more information, and to view the complete report, click here. SharePoint Server 2010 will require a 64-bit edition of SQL Server – more specifically either SQL Server 2005 or SQL Server 2008 running on Windows Server 2008. SharePoint Server 2010 will not support Internet Explorer 6. Users will have to use Internet Explorer 7 or above. However, non-Microsoft browsers such as FireFox 3.x (on Windows & non-Windows platform) and Safari 3.x (on non-Windows platform) will be supported. The Office 2010 beta will be available in July, but SharePoint Server 2010 beta will not be made available at that time. Enterprise Search in Office 2010 has been improved, with Microsoft’s recent acquisition of Fast Search & Transfer. This information was revealed during the TechEd conference. 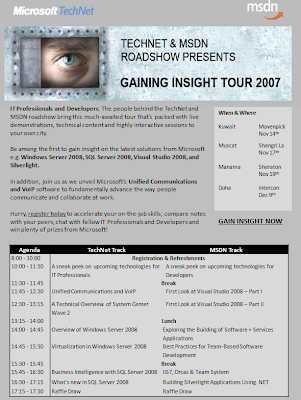 It’s that time of the year again – the MSDN and TechNet roadshows are coming soon to your city! The event will focus a first look on technologies like Windows Server 2008, System Center Configuration Manager (new version of SMS), System Center Data Protection Manager, System Center Virtual Machine Manager and SQL Server. You will also be among the first to see us unveil the new Unified Communications technologies from Microsoft – a solution that will revolutionize the way people communicate and collaborate in the workplace. If you’re an IT Professional or a Developer looking to gain insight and an edge over others, then you’ve got no excuse to miss out on this event! You may even walk away as the lucky winner of the new X-box 360 Elite! Microsoft has announced that the event will be held on November 19th at The Sheraton in Bahrain, Dec 4th & 5th at Habtoor Grand Hotel, Dubai and the 9th of December at the Intercontinental Doha. Microsoft has officially announced that it will no longer support SQL Server 2000 Service Pack 3 from July 10, 2007. Microsoft Customers who are running their systems on SQL Server 2000 Service Pack 3a or an earlier Service Pack (*yikes! *) should consider upgrading to Service Pack 4 or better still, SQL Server 2005. SQL Server 2005 without any Service Pack installed will also be “not supported by Microsoft from July 10, 2007”. Other products joining the “not supportable” bandwagon include SUS 1.0 and SUS 1.0 Service Pack 1 on July 10, 2007. Microsoft will stop supporting Microsoft Business Solutions Great Plains 8 from October 9, 2007. Microsoft has also announced that Exchange Server 2003 Service Pack 1 support will cease on January 8, 2008. So those of you out there still running Exchange 2003 Service Pack 1 will need to install SP2 to get Microsoft to support you.